A three-dimensional, cross-linked polymer sponge attaches to the metal plating of a lithium metal battery anode, allowing ion transfer and limiting deterioration. Image: Donghai Wang, Penn State. 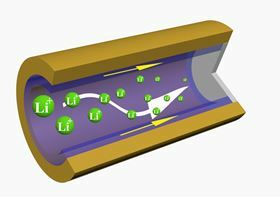 Dramatically longer-lasting, faster-charging and safer lithium metal batteries may be possible, according to researchers at Penn State who developed a three-dimensional, cross-linked polymer sponge that attaches to the metal plating of battery anodes. They report this work in a paper in Nature Energy. "This project aims to develop the next generation of metal batteries," said Donghai Wang, professor of mechanical engineering and the principal investigator of the project. "Lithium metal has been tried in batteries for decades, but there are some fundamental issues that inhibit their advancement." One of these issues is that lithium metal batteries are vulnerable to dendritic growth – needle-like formations that can reduce cycle life and potentially cause safety issues, including fires or explosions. "Our approach was to use a polymer on the interface of the lithium metal," Wang explained. The material acts as a porous sponge that not only promotes ion transfer, but also inhibits deterioration. "This allowed the metal plating to be free of dendrites, even at low temperatures and fast charge conditions." Wang is an affiliated faculty member at the Penn State Institutes of Energy and the Environment (IEE) and also belongs to the Battery Energy and Storage Technology (BEST) Center, a leading research institute in energy storage. A critical component of both the IEE’s and the BEST Center's missions, this project brought together researchers from different disciplines within the university. "The collaboration in this cohort really helped drive this paper forward," Wang explained. "It allowed us to examine the different aspects of this problem, from materials science, chemical engineering, chemistry, and mechanical engineering perspectives." In this collaborative work, Long-Qing Chen's group in Penn State’s Department of Materials Science and Engineering conducted modeling work to understand how the polymer improved lithium metal anodes. According to the researchers, the practical applications of this work could allow more powerful and stable metal battery technologies integral to everyday life. "In an electric vehicle, it could increase the range of a drive before needing a charge by hundreds of miles," said Wang. "It could also give smartphones a longer battery life." Looking to the future, the team will now explore the practical applications in a large-format battery cell to demonstrate the advantages and feasibility. "We want to push these technologies forward," said Wang. "With this work, I'm positive we can double the life cycle of these lithium metal batteries." An anode made of graphene and carbon nanotubes can prevent the formation of dendrites in lithium-metal batteries.